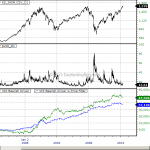 Tick Index is not a stable statistics just like the advance decline issues of NYSE. There are always changes to the issues listed and the issues being traded. But the worst offender is the way the US stock markets (and pretty much all the major stock markets in the world) has changed since 2007. This fundamental change to the trading activities in the stock markets has affected the way NYSE Tick Index behaves significantly. 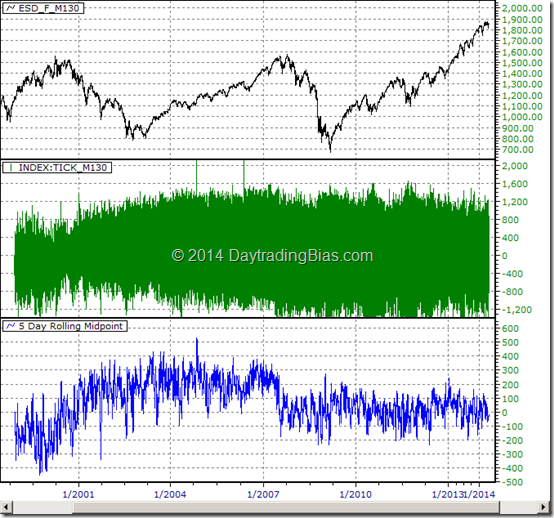 I am going to show you the way NYSE Tick Index behaves before and after 2007. From there you will have a better idea in dealing with its historical data. 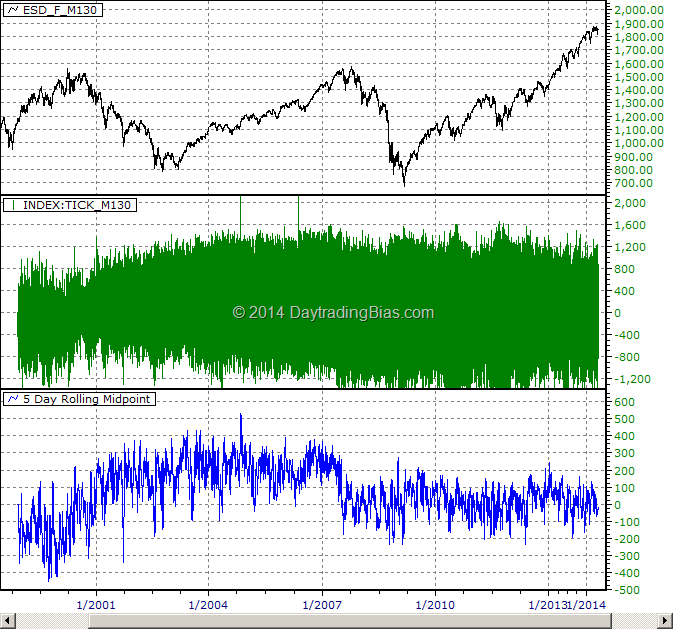 More importantly, a correct perspective on proper backtesting with Tick index. If you do not know what NYSE Tick index is, please read the introduction on what Tick Index is and go through the first few articles of this series. 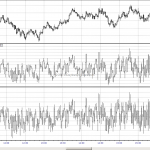 Following is a chart of Emini S&P, NYSE Tick Index and its 5-Day Rolling Midpoint in 130-Min timeframe. Looking at the NYSE Tick Index itself in the middle pane of the chart (in green) probably causes some of you a headache already. It looks like a mess. If you pay attention to how Tick Index is constructed, you would understand why Tick Index has such an extreme coverage of positive and negative values. Behind the messy readings of the index, however, is that the range covered by the index is not stable. In fact, the range coverage of the Tick index does not behave the same way it did back in 1990s, early 200s and 2010s. To make it easier to analyze the difference, I have the rolling midpoint of the range covered over 5 day period plotted at the bottom (in blue). It is clear from this graph that Tick Index has undergone several changes over the years. But the most important part is that it has settled into the current form since mid-2007. 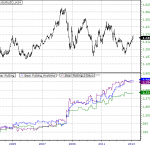 It could be difficult to understand why Tick Index suddenly take such a turn in its behaviour since 2007. Without investigating into the reason, it will stay a puzzle and counter-productive for traders who depends on the breadth data for trading setups and signals. Hence it is necessary to dig deep to figure out why Tick Index changed the way it did back in 2007. As I mentioned in Market Breadth Primer: Advance / Decline Issues Past and Present, during 2007 the stock market has undergone a drastic move towards trading a controlled and narrowly focused basket of stocks everyday. That pretty much altered all the market breadth data I’ve been collecting since the 1990s. Following is the chart from the article illustrating the change. Notice how the number of issues traded, the blue patch on the 4th pane, has settled into a tight range since the drop from mid-2007. Think of this as a transformation, or evolution, of a dynamic systems. Any newly created systems are not very stable and its participants are not aware of its behaviour. Over time, people gained knowledge about the system and started to anticipate its changes. After several iterations of adaptations, the system will settle into a stable equilibrium. Of course, when something breaks the balance, things will go back into chaos again. For now, the US stock market has matured into the current stable form since 2008. There are many advantages of a stable market system. 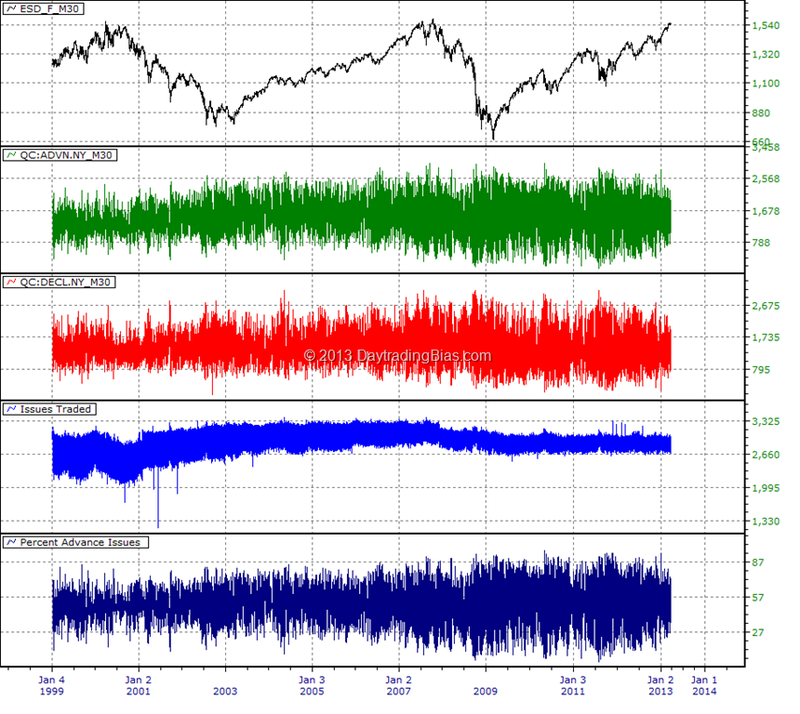 First and foremost, market breadth will triumph all other metrics used to analysis the stock market. That’s because the crowd behaviour of the trading community becomes the main driving factor of the short term market swings. In the case of Tick Index, it is always clear that many patterns on both intraday basis and swing basis are leading in nature. 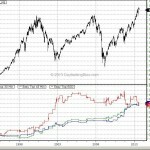 Since the stabilization of the stock market from 2007, these patterns get even stronger with their forecasting ability. From what I see, until there is a structural breakdown of the financial system around the world, the leading nature of the market breadth data will stay for a long time. Do not mistaken an overall market down turn or rally on long term basis as a change in the underlying stability of the stock market. This assumption is completely wrong. 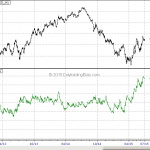 The stock market system as a whole can be completely stable with its market breadth data also stable while the price level of the stock market fluctuates wildly. 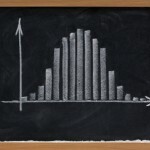 That is change in volatility of the stock market in general, not destabilization. 1. Mechanical trading signals designed before 2008 that focus on extreme short term moves are not likely going to work now. By the same token, do not expect systems designed to scalp after 2008 to perform well before that. Understanding the reason behind, it will save you a lot of grief and frustration when you are designing and backtesting your trading models. 2. Longer term trading setups based on Tick Index has to be normalized so that they can be used across the 2007-2008 boundary. 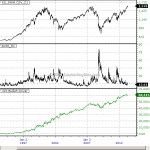 Raw signals based on absolute value of the index will have a hard time working across eras. Thanks for the article, so if you could sum up the changes in the TICK it would be that it would be more useful for scalping than swing trades (post 2007)? No. 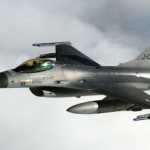 It is the overall decline in accuracy due to noise level has increased significantly. 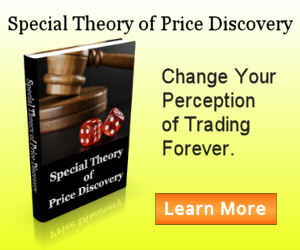 So both types of trading suffers. 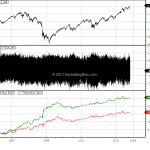 Custom tick indices based on the major indices do not suffer this problem though.